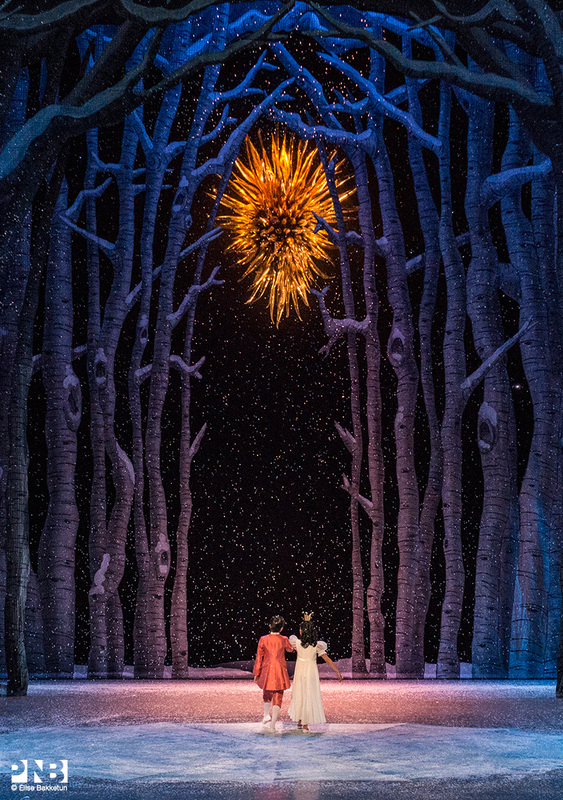 The prominent Christmas star that appears at the end of Act I of Pacific Northwest Ballet’s production of George Balanchine’s The Nutcracker® is presented by renowned artist Dale Chihuly. Winter Star, a spectacular work of art from Chihuly’s popular Chandelier series, makes a stunning addition to the famed snow scene. Chihuly first showed a Chandelier in 1992 during the opening exhibition at the Seattle Art Museum. The show marked the moment when he started to work with this form in architectural settings. Chandeliers range from three to 30 feet in length, are comprised of as many as 1,000 pieces and imbue a magical sense of wonderment. With significant historical provenance, Winter Star debuted as part of the artist’s iconic Chihuly in the Light of Jerusalem 2000 exhibition, and has also been exhibited at the Royal Botanic Gardens, Kew (near London) and New York Botanical Garden. Chihuly is credited with revolutionizing the Studio Glass movement and elevating the perception of the glass medium from craft to fine art. He is globally renowned for his ambitious, site-specific architectural installations in public spaces, and in exhibitions presented in more than 250 museums and gardens worldwide.